Borregaard BioPlant ApS was established in Denmark in 1992 and has since then become the leading supplier of biocontrol products in Scandinavia. We produce and import natural enemies and pollinators for protected crops in Scandinavia. Part of our production is exported to other European countries. It is the aim of Borregaard BioPlant to further develop IPM in outdoor crops. This is being achieved through trials in field vegetables and fruit orchards and subsequent registration of new 'soft' pesticides and microbiological products with the Scandinavian EPA. 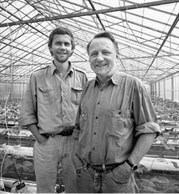 1992 - After many years of experience working as a biocontrol advisor, Steen Borregaard founds the company Borregaard BioPlant. 1993 - Distribution of beneficials is launched in Norway through the company 'VekstMiljø AS' in Stavanger. 1999 - Borregaard BioPlant merges with the Zealand based company 'Jørgen Reitzel A/S' and thus achieves branches throughout Denmark (Århus, Odense and Copenhagen). 2000 - Direct sales for the hobbymarket are established through the homepage http://www.nyttedyr.dk/. In 2007 a similar homepage is created for the Swedish hobbymarket. 2002 - Borregaard BioPlant moves into new buildings at Hammerholmen in Hvidovre and enlarges its production facilities. 2004 - In cooperation with former employees from 'Svenska Predator', Borregaard BioPlant founds the Swedish company 'Biobasiq Sverige AB'.